Maternity portraits. You may think you don’t need them…it’s the baby who will be the focus for photography. What??? No, no, no! Pregnancy is a beautiful thing. Pregnancy HAIR is a beautiful thing. (Can I have it back, please?) Pregnancy skin is amazing. GLOW! And what is more, someday your little one is going to ask about being in your belly and “How big WAS the belly?” It is nicer to be able to pull out an album of images with gorgeous color where you look fabulous than to pull out a 4×6 glossy print of you in yoga pants in the living room. (I have plenty of those, but you need more than the quick snapshot). I’ll even help you pick the wardrobe. Just do it, you’ll be glad that you did! 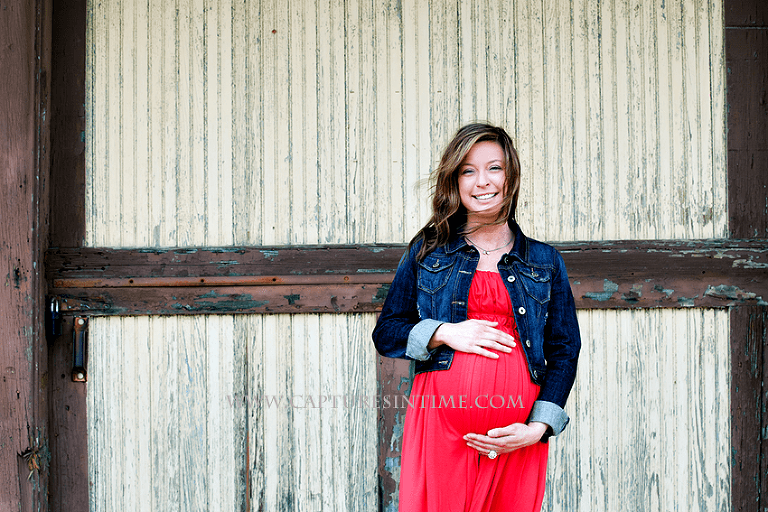 For your maternity session, you can choose a studio session, an outdoor session or a combination of both. This session is in historic downtown Blue Springs, right outside of my studio. I love to include dad in the maternity session, it is an experience you both will remember, the excitement for that new baby to come, definitely translates to the images. THIS particular session was a full-on riot. Dad was a hoot. I had to take breaks from shooting just to crack up. I love it when clients wear bright colors and I have a gorgeous street in front of the studio. I loved mom’s clothing choices, you can never go wrong with a maxi dress and color. The jean jacket adds pop and ties dad’s blue together in the portraits. She looks so great in red! Have I mentioned that bright colors outdoors are my FAVORITE?